Look for showers and thunderstorms to remain in the forecast over the next several days as another slow moving front wobbles across the region. Temperatures will remain above average. Today and Tonight: After a high in the low to mid 70s, a strong upper level disturbance and front will heighten rain coverage again on Thursday. Scattered to widespread showers and thunderstorms can be anticipated—especially in the afternoon and evening. There should not be much in the way of strong to severe weather. Once rain ends tonight, expect continued clouds, returning fog and lows in the low 60s. Up Next: There should be a slight downturn in precipitation on Friday. High temperatures will warm into the mid and upper 70s. Previously it looked as though a potent cold front would move in by Saturday night. Now, it seems that will hold off until Sunday. Depending on the position of the old, stalled front, scattered showers and thunderstorms may be around on Saturday. However, forecast confidence is low in timing and coverage of rain and storms on Saturday. By Sunday, the “flush out” cold front will finally push into the region. Expect an unsettled finish to the weekend. Much cooler than average temperatures will follow with readings 10-15 degrees below average for Lundi Gras and Mardi Gras. If you got the growing season going, pay attention to temperatures Monday and Tuesday night as freezing is not out of the question. 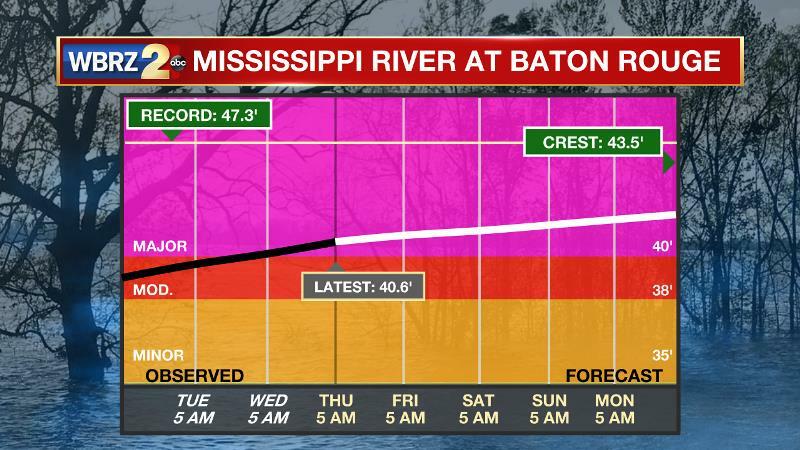 The Mississippi River: Major flood stage has been reached in Baton Rouge with a level of 40.6’ as of Thursday morning. Though the classification of “major flood stage” sounds scary, impacts to land are minimal thanks to levee protection. The high water is primarily an issue for river traffic and river islands as well as a few spots north and south of Baton Rouge that will turn soggy along the banks. At this time, the river is projected to crest by late March at a level similar to what was reached last year around 44’. An approaching front and upper level impulse will trigger scattered showers and thunderstorms on Thursday. A strong storm cannot be ruled out, but the parameters just do not look favorable for anything significant or widespread. Hail would be the most likely threat from any storm this afternoon into early tonight. Friday and Saturday present a very challenging forecast. 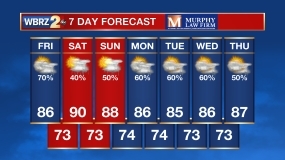 The wrap to the week will be warm and muggy but showers and thunderstorms are questionable. Any weak disturbance in the atmosphere could spark some activity but it is uncertain whether or not one will be present. A very similar situation is expected Saturday though there is just a little more confidence that showers and thunderstorms will develop, but the timing is questionable. The forecast for Sunday is a bit clearer and looks more impactful. A deep, longwave trough will move into the Upper Midwest and Great Lakes regions sending a strong cold front toward the central Gulf Coast. With ample instability due to the advancing cold pool aloft, and the forcing generated by the cold front, confidence is high in widespread rain and thunderstorms. In fact, the cold air looks deep enough that hail and gusty wind could occur with some thunderstorms. That front will restore wintry temperatures with well below average readings through the middle of next week. Expect highs in the 50s and lows in the 30s through Wednesday. A freeze is not out of the question.